Here is a quick one. I made this dress from a soft Ponte Roma in two hours from cutting to wearing. 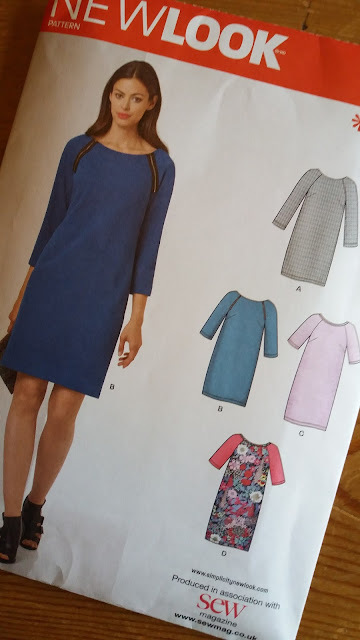 I used a free pattern from NEW LOOK to make this simple dress with raglan sleeves. Arm zips not for me thanks. I cut a 12 but it had a lot of ease in the sleeves and underarm area so I think I would cut a 10 next time grading out for my hips to a 12- there will be a next time. A bit smarter than a tunic but just as comfortable, this dress has been so comfy for work where I am sometimes stood up teaching for two hours or sitting at my desk for two hours. Now the clocks have changed and the bleakness of November is upon us I am struggling to take good quality photos so they are a touch grainy I am afraid but I think you get the idea. 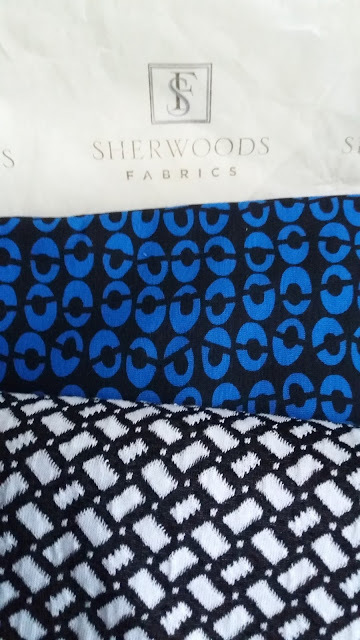 The fabric is from a new supplier to me (no affiliation or sponsorship) but you speak as you find and I was delighted with my parcel from Sherwood Fabrics. On time, cut straight which is a rarity and beautifully wrapped in tissue like a little gift to myself. They have a comprehensive range of dress fabrics that mimic ready to wear fabrics rather than stocking novelty or craft fabrics. There is a good SALE and remnant section too. I will be going there again. 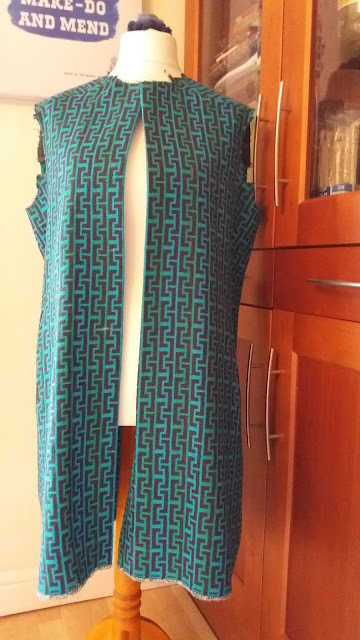 I was in a geometric state of mind for this online shopping trip. 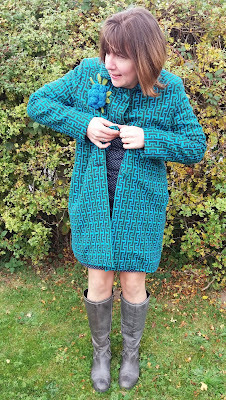 The prefect cosy, easy, winter dress. PS. Our PC has gone bang so I have limited access to the internet and photoshop software so bear with me while I find a repair outlet. I have some December posts already on my dashboard so I may lose some time continuity over the next few weeks. This month my Minerva make has an almost festive winter feel. 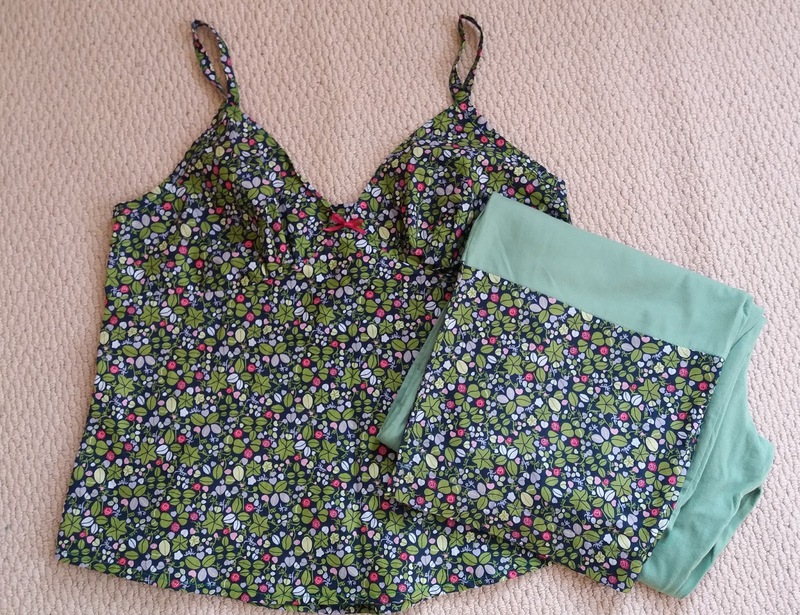 I have made two sets of the Fi Fi PJ set by Tilly and the Buttons for my friend's daughters (slim ones!) and I finally felt sure I wanted a pair myself. I LOVE making this pattern. It is so accurate and detailed with fabulous results every time. 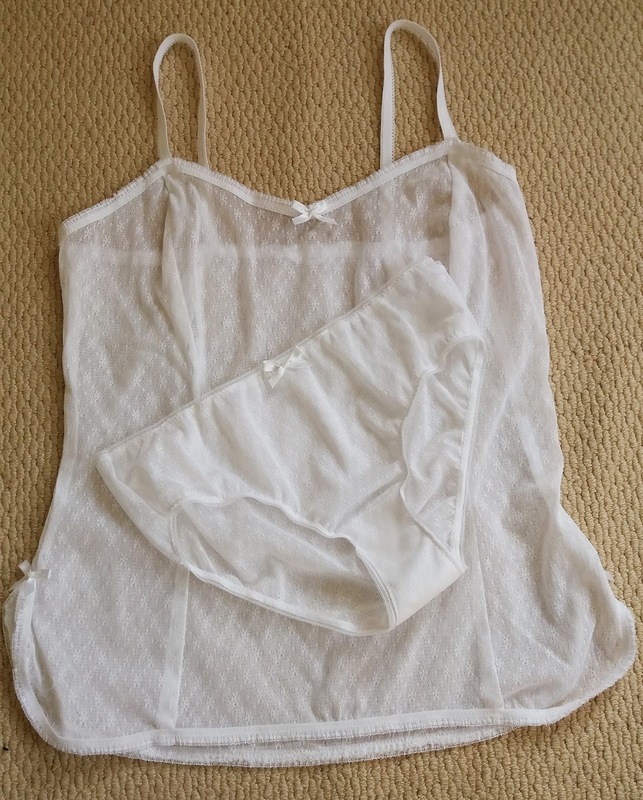 This has just come out of the wash but shows the fabric in all its glory. I chose a botanical print from Minerva with a colour palette of festive green with red roses revealing little ivy motifs. 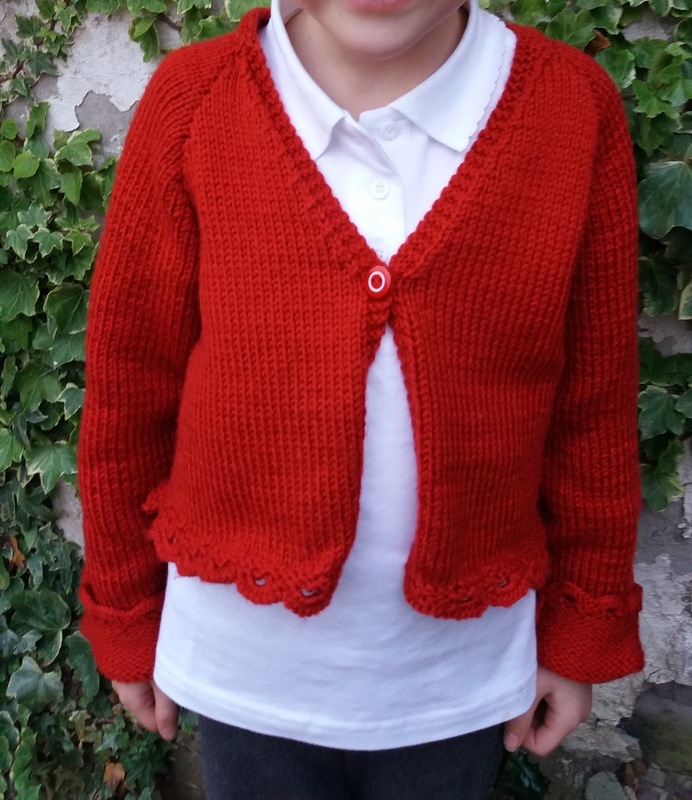 It is a beautifully soft high quality cotton but unfortunately this pattern has sold out but there are designs. Fifi is a bit of a fabric pig because you have to cut on the bias but you can reduce this by using ready made satin bias binding in a colour you pick out from the print however, I just love making it. 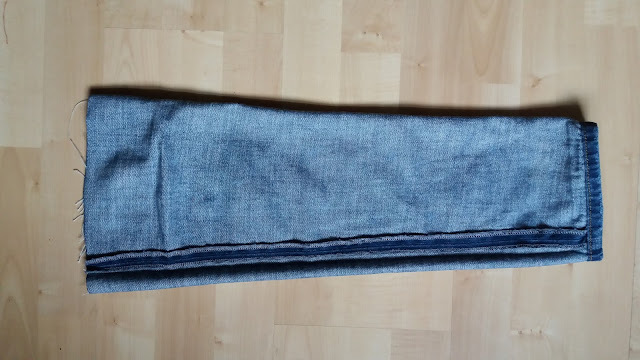 As it is colder, I decided to make long bottoms using a combination of the patterned fabric at the ankle cuffs and some single jersey for comfort. I love my beautiful new set in my favourite colour. In the end I had to sub contract the sleeves out to my mum who whipped up two in six days while I limped on in the same amount of time on the left front. The sleeves were a bit long because the little one was not around for a testing but Little M said it means she can wear the cardigan for longer - how sensible! The yarn is WI aran from Hobbycraft. This wool washes so well week in week out and is so soft, I have used it before. 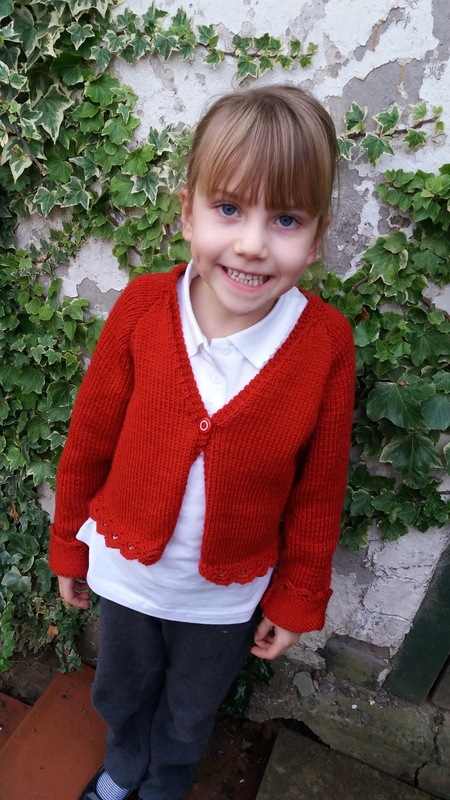 The pattern is from Sirdar. 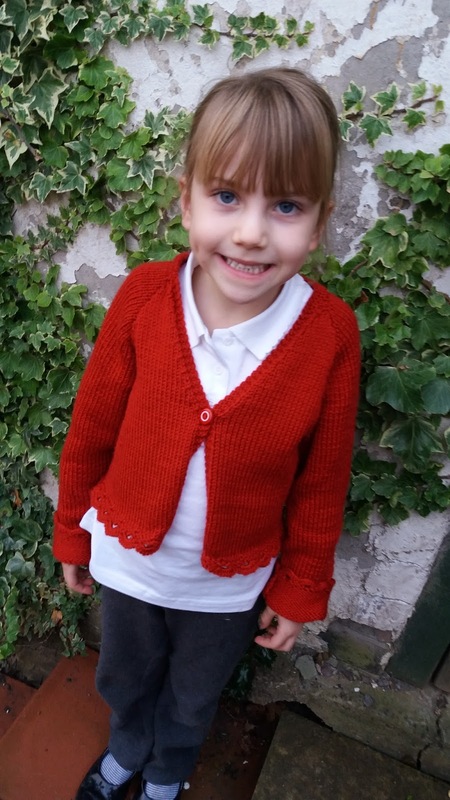 It really was her turn for a school cardy and she knew it so another red cardigan was not to be avoided. I washed and blocked it but it is still a bit curly on the front button band. I have physio exercises to do for my frozen shoulder but it is a slow process. Anyway it just goes to show what you can do if you share. Thanks Mum. Ps. Overseas followers, this is a version of a primary school uniform which children under 11 wear to school. Very often they are asked to wear a combination of grey trousers/skirt with a white T-shirt/cotton shirt and a jumper of their school colour. 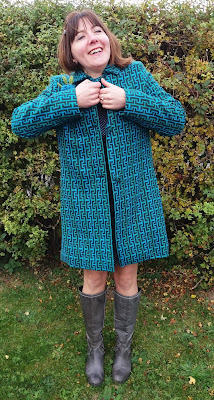 Colours vary but that is what happens in the UK just in case you wondered why my girl was dressed as a boy in a scalloped edged cardigan! Us crafters are busy at this time of year making presents for family and friends. 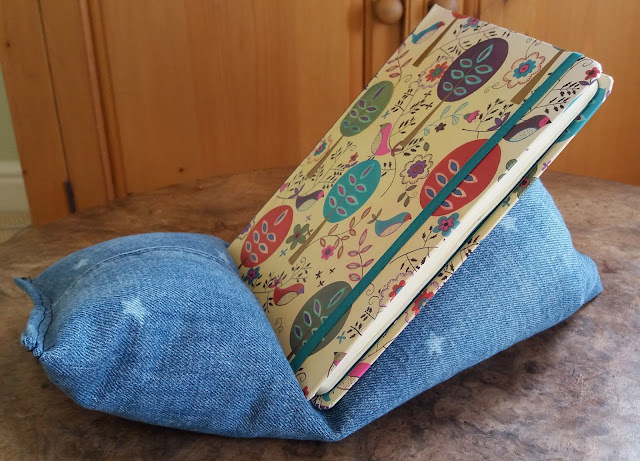 This little project is so inexpensive, quick and easy, I thought I would share it with you.It is a kindle/ipad/tablet/book lap beanbag perfect for crocheters who follow a pattern on an ipad while needing both hands free to work their magic or simply to use both fingers while typing on an ipad. 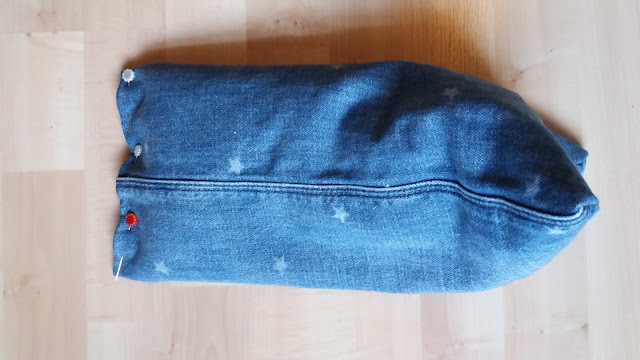 I used the bottom part of a pair of jeans. 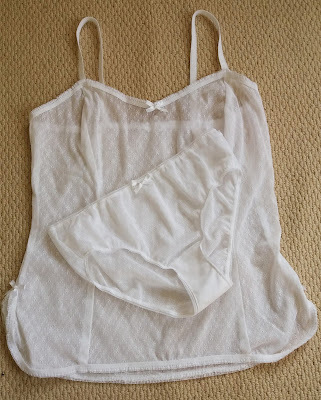 The top had been refashioned last year from large jeans into a miniskirt here. I had stowed the remaining legs in my craft cupboard and came across them the other day. Two of the main seams required are already done if you use jeans but you could cut a piece of fabric 50cm x 46cm and sew it along one seam to make a tube. 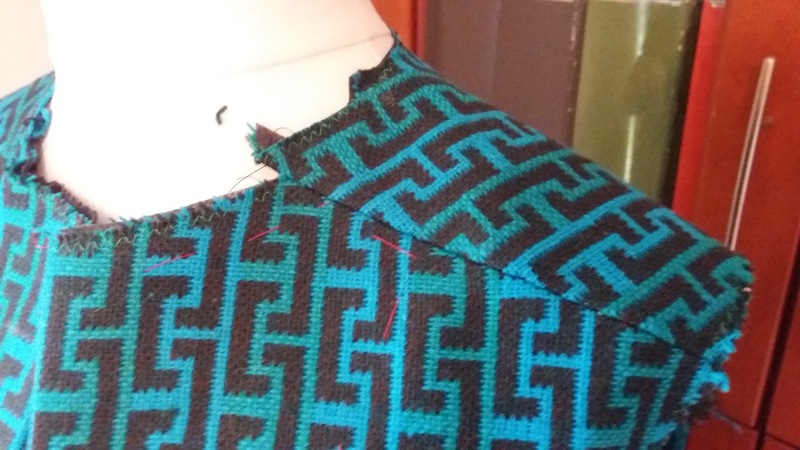 Sew across one end. Trim off the corners and turn it the right way. Fill it by three quarters with bean bag beans. 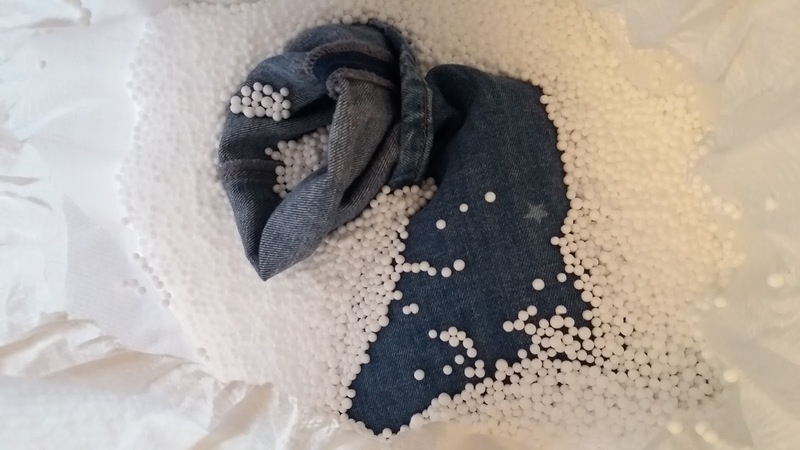 You could liberate some from a current beanbag - nobody will notice! They get everywhere so do it inside the bag, don't try to pour them. Turn under the opening making a seam and top stitch the end closed. Ensure you make the seam go in the opposite direction to the first end. This one is for a man so the denim worked really well. This has to be one of the easiest things I have ever sewn; a camisole in stretch lace to wear under jumpers. 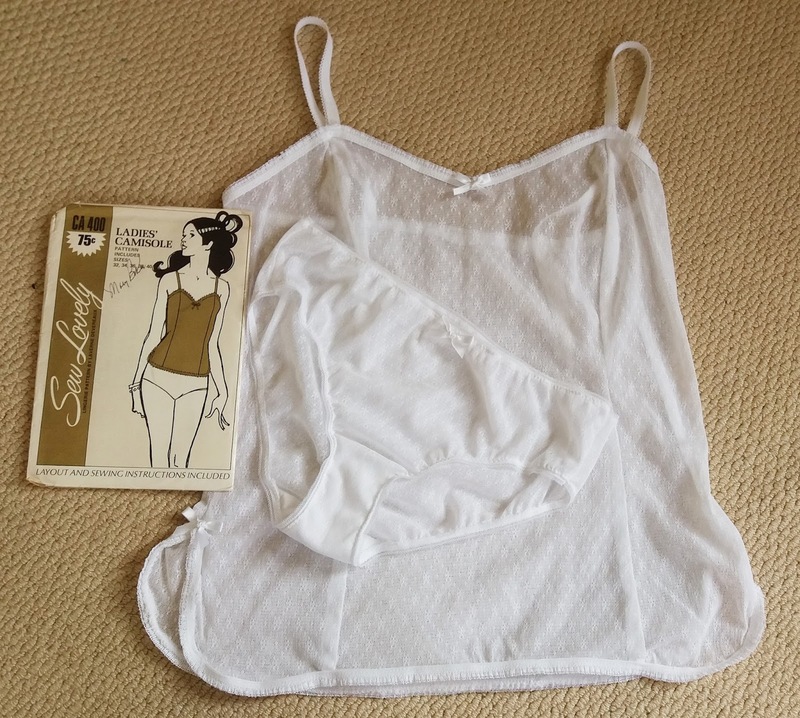 It is from an american pattern circa 1970 by Sew Lovely. 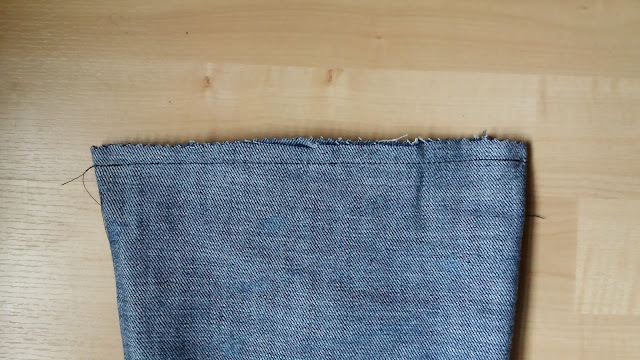 The fabric is sewn together using french seams to enclose the raw edges and the elastic was applied after I had overlocked all the way around the edges. Pretty bows were added as a finishing touch. Simples! 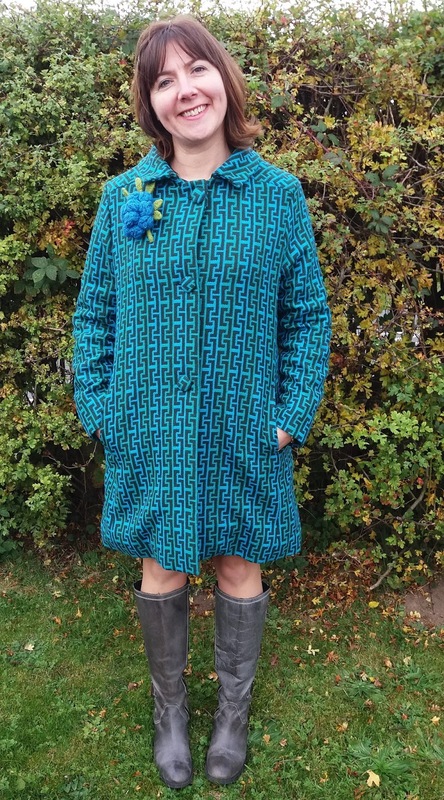 The fabric is from White Tree fabrics and was a complete bargain at £2.00 a metre in their mega summer sale a while back. 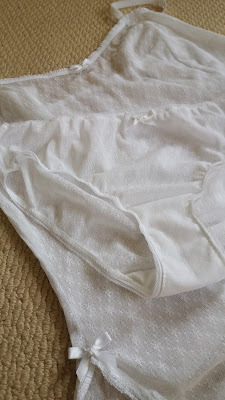 The knickers are about my fourth attempt at getting the So Zo free pattern to come a little higher up my bottom. These are the best so far but I could do with 2cm more on the back. You can't just add on 2cm in depth because then the sides are massive so each time you have to keep arching more out of the leg. Some might say why bother but I like learning new things! I have worn them both for a whole day and I didn't know I was wearing them. They have both been through the wash too with great success. 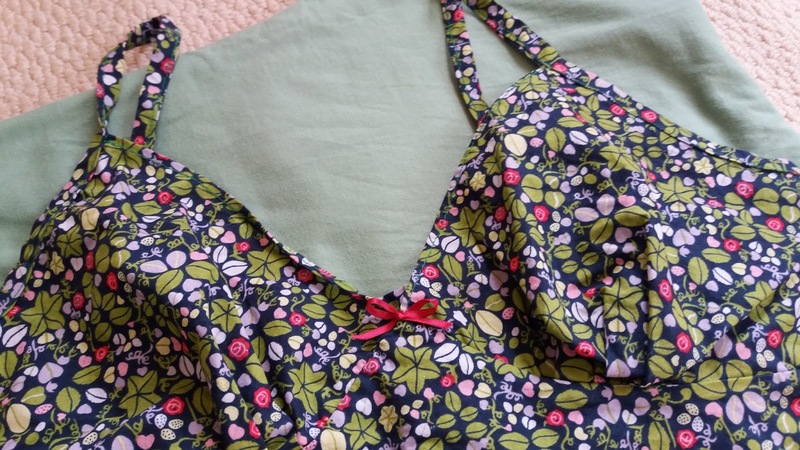 Have you ever made a camisole? Why should you try batch cutting? 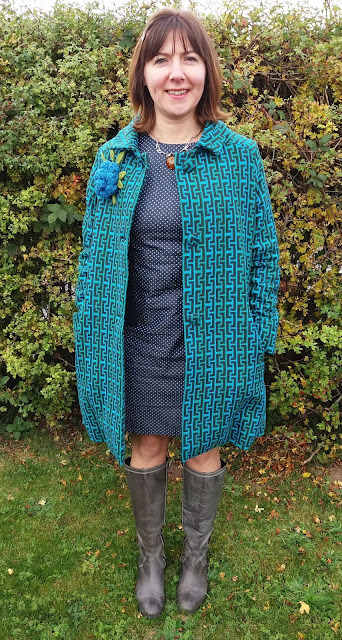 Thank you so much for all your wonderful comments about my new coat. It is getting some wear I can tell you...Brrr!But today I want to share something else with you. If you are full of sewing procrastination my remedy is to commit by cutting out. 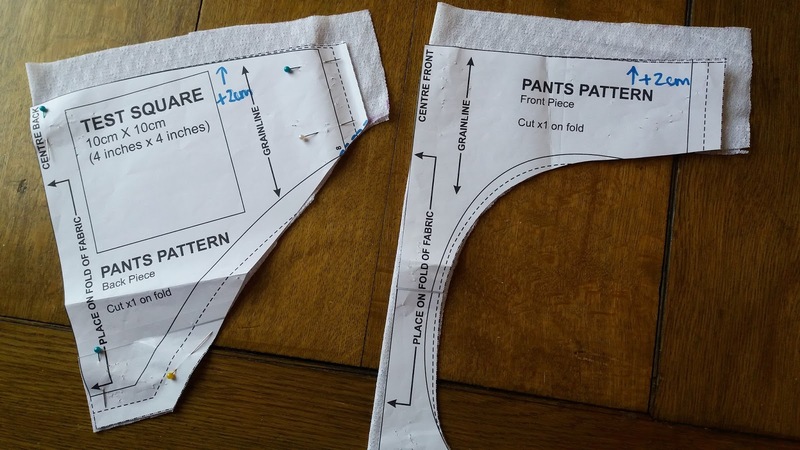 This is a devilishly brutal way of starting sewing projects but puts a stop to that 'saving-fabric-for-something special' scenario that happens to so many of us. I cut out in batches. Why? 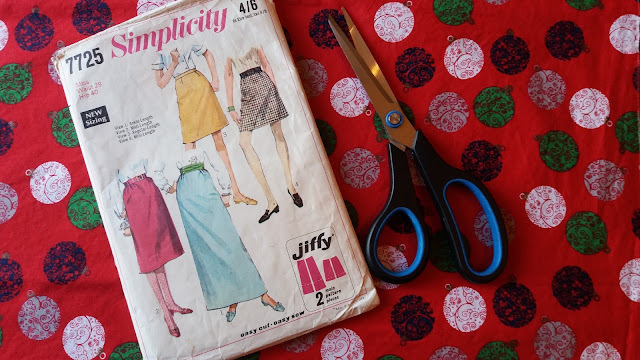 Maybe I am going to make a Christmas skirt. But if I cut it, I am definitely going to make a Christmas skirt. I am more committed to making the item once cut. I can make a mess all in one go and hoover once. Still messing around with the So Zo pants pattern. If I cut another pair and write down my modifications I might get there. 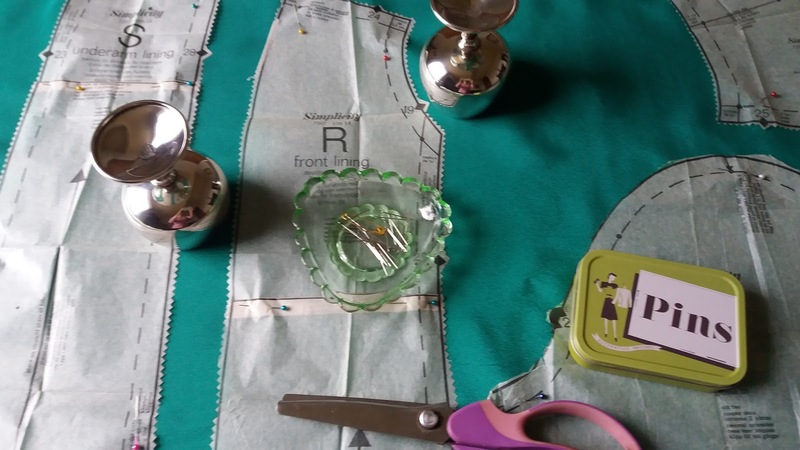 If you share your sewing space with family, it is a good way to only disrupt everyone once in a while. 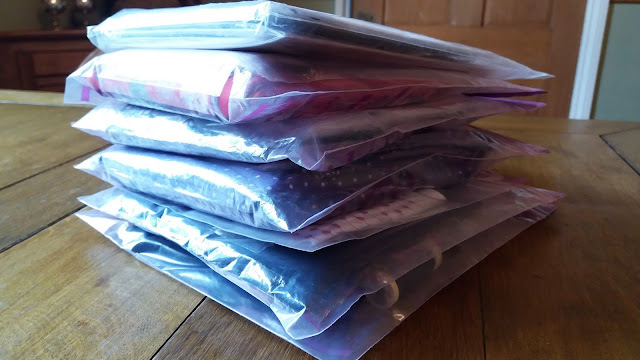 I can squeeze in half hour/hour sewing sessions with it all in a bag rather than having to think if I can be bothered to clear everyone's stuff away just so I can get started. You can also see the range of things you make. 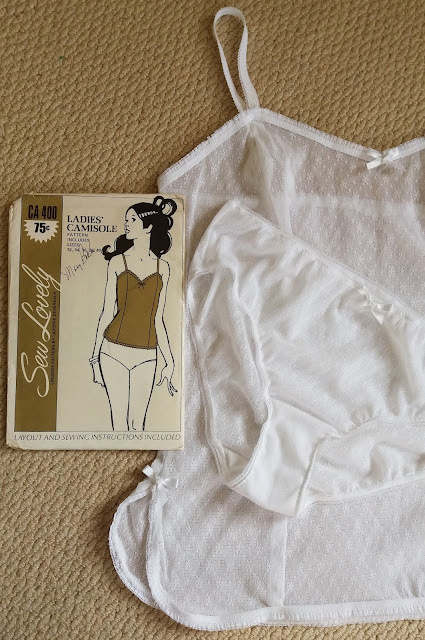 Today I cut two long sleeved T-shirts for the girls, one Coco for me, a blouse for me, an experimental Christmas skirt and the ongoing modifications for my perfect knicker. I can see what other notions I need to take a project to completion. 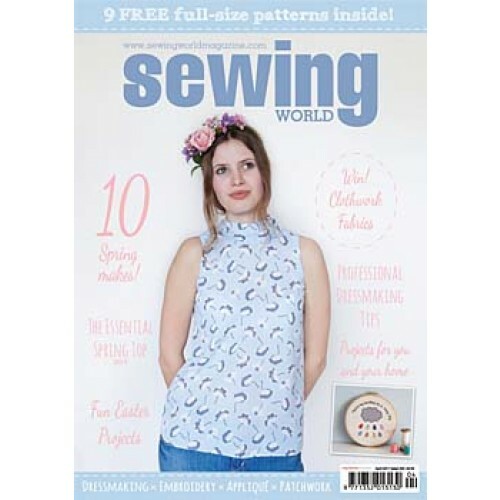 I can cut out easy and tricky things then depending on what sewing I want to tackle, I have a sewing choice. I don't really like cutting out so it gets it all out of the way in one go. Each project goes in bag with matching thread and a bobbin if I have it and any notions I can find in my cupboard: zips, interfacing, buttons etc. I make a mental note of anything I need to buy and pop it in the bag when I find it over the following weeks/months. 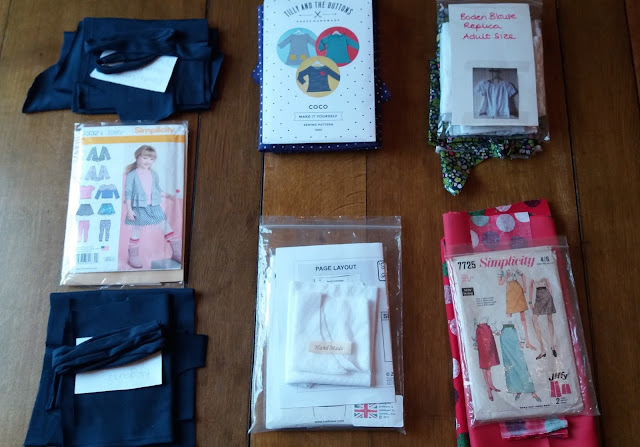 Hours of happy sewing all lined up in little bags - I can choose easy or hard, drafting or instructions, stretch or non stretch. 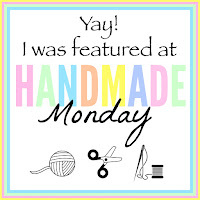 Thanks for stopping by to read a little about my making process. Are you a cutter or a procrastinator? 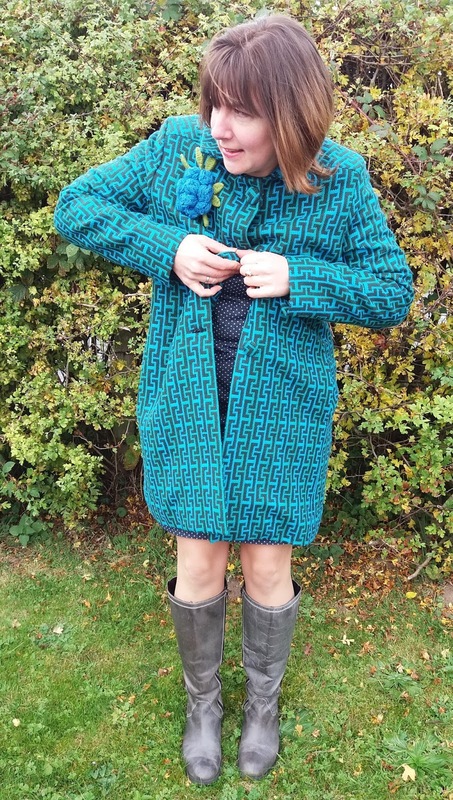 I have been thinking about a coat for a while now since my blog friend Christina made a duffle coat in January 2016. I had been toying with a coat pattern but was waiting for the right fabric at the right price to reveal itself for view A. A coat is a slow-burner even in sewing terms. 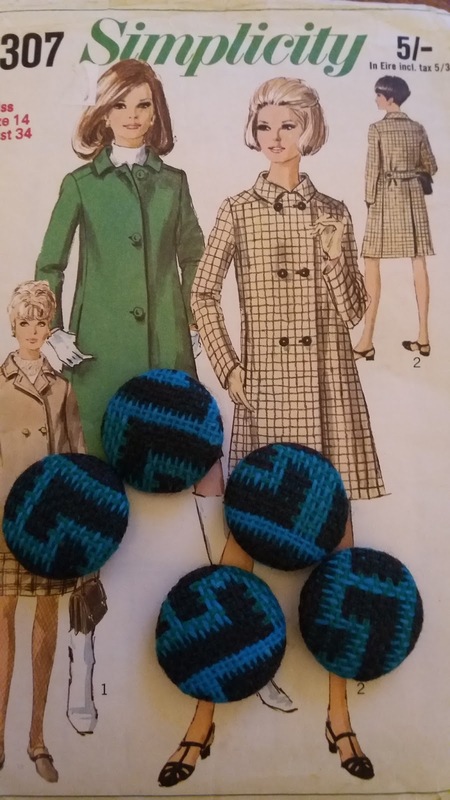 I seriously thought about this pattern today by opening the packet to see if I had enough fabric. 'X@£*X%!' (insert your own expletive here) but on opening the envelope, I discovered the pattern was not marked. Bum! I flicked through my pattern box and found Simplicity 7307 (1967) instead which is a marked pattern but still has the 1960's vibe. I felt happier instantly. My eyes were on view 1. My notions arrived from Minerva Crafts. 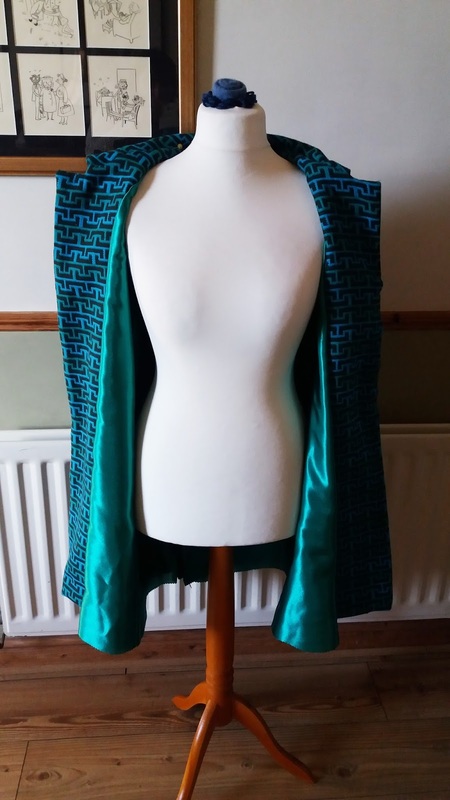 A pop of green silky lining, interfacing to give the front and shoulders structure, thread, a hanging chain and self-covering buttons. I looked at it all together and decided I needed to make a toile for this amount of investment. Made a toile ('twahl') last night and today to add 2" to the bust. I used curtain lining and tacked it together. 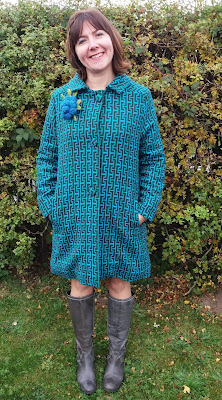 I tried it on with a sweater too and the armholes were still big enough which was my main worry. I also found the correct length by shortening. These fabric pieces will be my pattern cutting pieces. Tonight I sat and covered five buttons, three for the front and two for the belt on the back. Mmmm, a small job but very satisfying. I had an hour joining the main pieces together. The toile making and the three hours of pattern matching while cutting out feels like it is really paying off today. 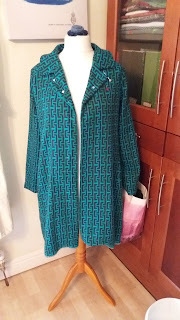 Easy sewing with notches and patterns that matched. Sleeves in today but they feel strange. On closer inspection I have inserted the sleeves at an angle. Unpick. Try again. Much better. Collar on as well which rolled like a dream. Haven't decided how to wear it yet. Also I pinned the belt in place and tried it on - yep, that short body of mine meant I had to move it up by 2 inches to stop it perching on my bottom. I didn't want the discomfort of sitting on two buttons either. The girls go for a play at a friends so I cut out the linings today. I joined the linings last night. 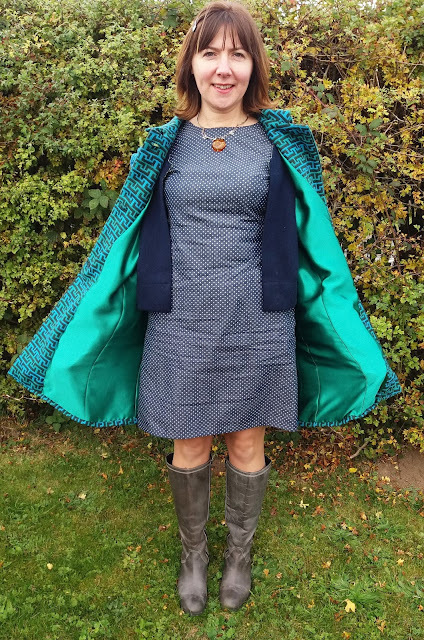 Let me introduce you, "Lining, coat, coat, lining. You two rub along together now and don't argue with each other!" They did at first, then they fell out over a kick pleat. Duh! 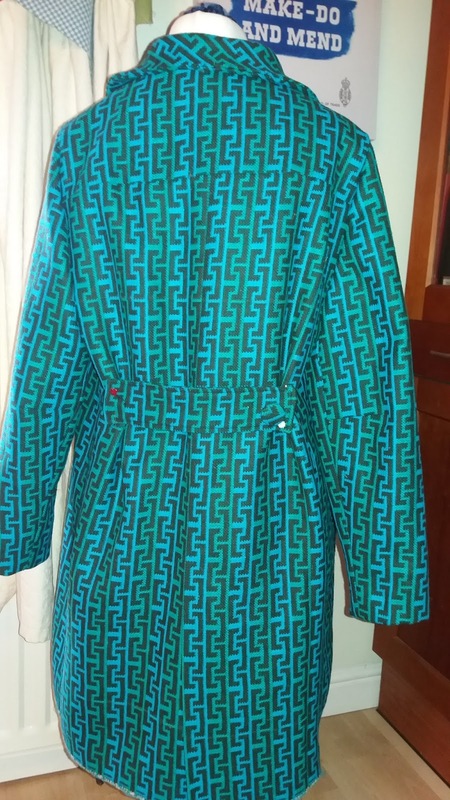 I shortened the coat but not the lining pieces so the slit was in the wrong place. Time to stop today. 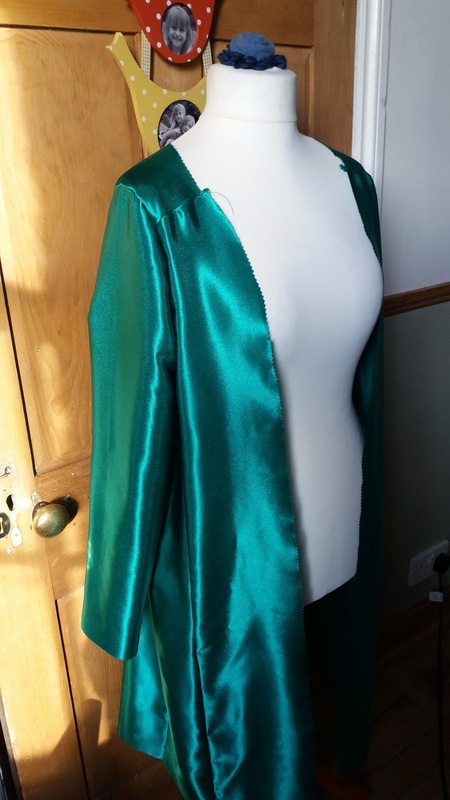 Kick pleat adjustments to the lining were made today with a great deal of hand sewing to attach the hem and sleeve cuffs to the lining. EEEEK! The front button holes - the make and break of any garment. 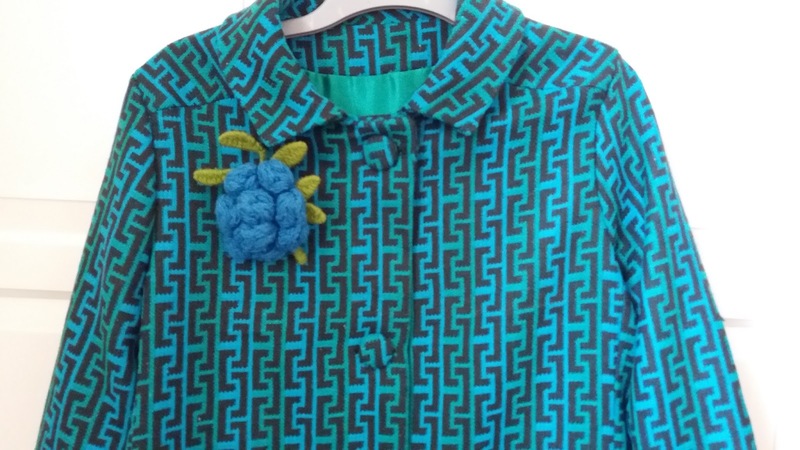 Added buttons now I just need to add the hanging chain and my label... because I only add my label to the things I am very proud of and this is one of them. 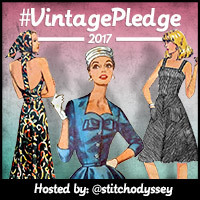 This one is going onto the #VintagePledge2016 Pin board. I love it but I will end with 'it still smells of a junk shop' so add a dry cleaning bill to that total! Thanks for spending your valuable time here. 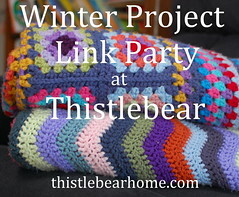 Hello if you have just popped over from Thistlebear. I am making a quilt and today I thought I would share how to make a log cabin pin wheel block. The fabric was a naughty escapade. I went to a Trade Craft show in January as a press blogger and purchasing was not allowed. I could make book orders for massive quantities but that is not what I was there for. I managed to pass £15 in notes under the table for these two mini jelly rolls and a fat quarter pack. I know, so cheeky but so irresitable. Jelly rolls are the business, they limit your cutting time but increase your accuracy. I grouped three together then cut a solid colour from my own stash. 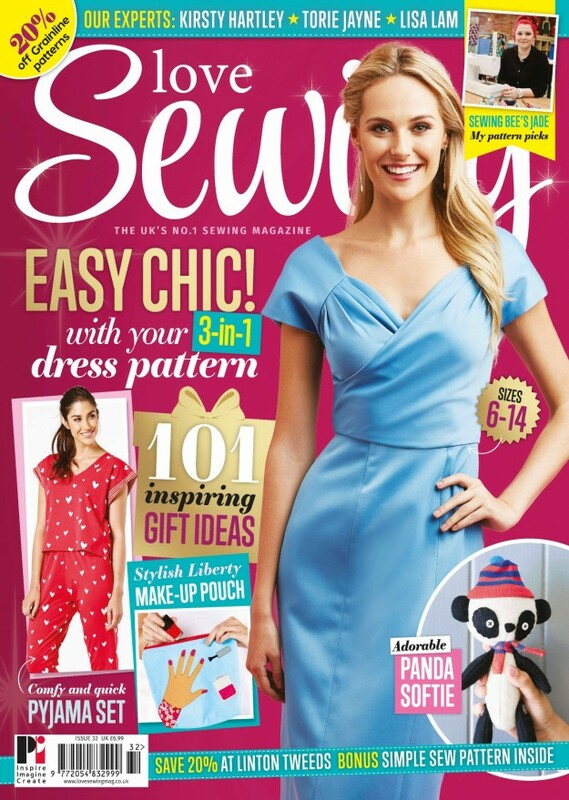 You simply sew in a straight line down the long edge using a 5mm seam allowance. I have a natty magnetic guide that I can pop on my foot plate to keep me in line. Bloke gave it to me in my Christmas stocking a few years ago. I didn't know I wanted one until I used one. Repeat. One hour sewing, two blocks made. Hope you are making progress no matter how big or small on your Winter Projects, I am off to check them out now.